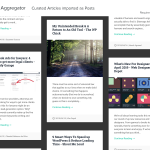 Added: Introduced a WP RSS Aggregator Gutenberg block. Added: Brand new debug log and logging system that stores logs in the database. Added: Items can now be added to the Blacklist manually. Changed: Refactored a lot of legacy code over to the new modular system. Changed: General display settings have been moved to the "Default" template type. Changed: Reorganized the general plugin settings. Advanced options are now under an advanced settings section. Changed: Removed the "Add New" menu item from the RSS Aggregator menu. 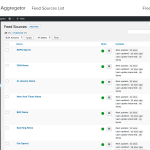 Changed: The feed sources page now updates every 1 second. Changed: Updated the TinyMCE dialog options for inserting a shortcode on a page or post (Classic Editor). Changed: Updated administrator and editor role capabilities, fixing various permission bugs. Changed: Updated a lot of setting descriptions and tooltips. Changed: The help support beacon is now enabled by default. Fixed: Import errors no longer "freeze" feed sources in an infinite importing state. Fixed: Some import errors would not be logged due to script timeout or execution errors. Fixed: Feed to Post was not able to show feed items in the shortcode. Fixed: Deprecation notices on PHP 7.3. Fixed: The "Force feed" option was not properly being applied to feed sources. Fixed: A bug that caused perfectly good RSS feeds to trigger gzip errors. Fixed: The "Delete permanently & blacklist" row action was appearing for non-feed-item post types. Removed: The notice that asks users to leave a review was removed due to various bugs. Fixed: An issue with Feed to Post not being able to show feed items in the shortcode. Fixed: An admin capability bug that disallowed admin users from fetching feed items. Improved the core plugin's on-boarding process for brand new users. Fixed the "Sorted" error appearing constantly in the debug log. The plugin now checks if it's running on PHP 5.3.9, and deactivates itself when not. There are over 1 million all-time downloads and more than 60,000 websites actively using the core version of WP RSS Aggregator to provide site visitors with a constant flow of new and relevant content. Some use that to position their websites at the top of the search results for their niche, others use it to fuel private sites. Whatever the case, you can make it easy for site visitors to keep on top of the latest developments in your niche through the use of RSS feeds. Start growing your audience for free by curating fresh, relevant content. Enhance your existing sites or build an entirely new one in minutes. Every time you find a great new source, grab the RSS feed URL, paste it into WP RSS Aggregator, and let the plugin do the work. Wake up every day to discover the new items that have been imported and displayed on your site overnight. We love the smell of fresh content in the morning! 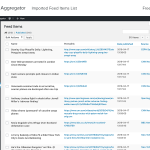 Browse our Showcase for even more real-life examples of WP RSS Aggregator in action. Import any number of RSS or Atom feeds from any number of websites or other online sources, to create your own unique mix of content. Nothing in the free version is artificially limited, the completely optional paid add-ons only provide additional functionality. 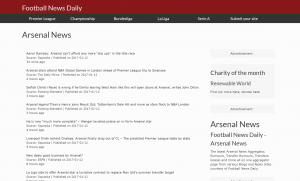 Simply add a website URL and our plugin will go and fetch any available feeds (not guaranteed to work for all sources). 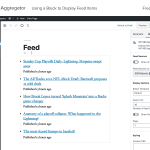 WP RSS Aggregator’s Gutenberg block and shortcode are powerful but easy to master. They give you maximum flexibility in terms of what appears where, how and when. Only import items with unique titles. Certain sources can have the same post published multiple times, or it may be published on multiple sites with the same title. This option ensures that you only import and share that post once. Create as many template styles as needed (NEW). 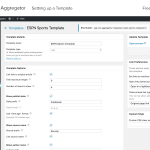 Through the use of templates, WP RSS Aggregator enables you to create multiple styles of displays that can be used across your site. Just select the template to use, choose the sources to show, and you’re all done. This can be done via both our Gutenberg block (NEW) and shortcode. Automatically link the source’s name and the article title to the original source, crediting them for their work, and adding value to their site by sending visitors their way. Just link you want to credit the original source, you also want to credit the author. They did the hard work, so we give you the option of including their name in the feed display. Video content is growing in popularity every month, so why not leverage that by having videos from reputable sources such as Youtube open directly on your site? The free core plugin is available in a number of languages over on the WordPress plugin repo, including Catalan, Dutch, English (US), Italian, Romanian, Russian, Spanish (Argentina), and Spanish (Spain). Find and display fresh, new content to engage and grow your audience. Curate content to keep your avid readers on your site for longer. 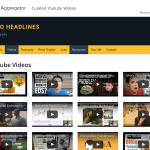 Embed videos from other sources (Youtube) to engage more visitors. Writers, display your works from multiple sites in your portfolio. WP News Desk curates WordPress news, tutorials and more from over 100 trusted sources. Travel Blogger Community does something similar to share blog posts from well-known travellers (requires Feed to Post add-on). 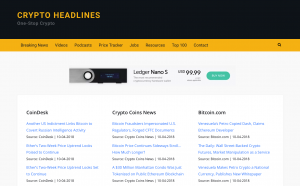 Crypto Headlines shares Youtube videos from popular Youtube channels (requires Feed to Post add-on). Euro Finance Blogs curates content on investment, personal finance and early retirement. And therefore, you can help boost your SEO! Learn more from WP Mayor. If you’re still unsure whether this is the plugin for your needs, please send us a message. Click here to open the changelog. 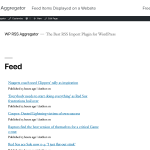 Q: How do I install the free core version of WP RSS Aggregator? A: Click on the “Download” button on the right. It will take you to the WordPress plugin repo from where you can download the plugin for free. Q: Is there any limit on the number of sources I can add? A: There is no limit in place for the number of feed sources. Having many (50+) feed sources should not present any problems in itself. However, pulling in items from many sites is bound to put your server under some stress, so you might want to consider using a hosting solution that goes beyond your typical shared host. Check out our dedicated page for hosting recommendations. Q: How do I display the imported feed items? A: Use our shortcode on any page or post on your WordPress site. It will automatically display all imported feed items from all sources, but you can use parameters to limit that display to certain sources. Q: Can I display the imported feed items as Posts in my website’s blog or some other dedicated section? A: Yes, you can, with the Feed to Post premium add-on. You will not only be able to store items as posts but as any custom post type. You can also set the author, set tags and categories, import images into the gallery or set featured images, import embedded videos and much more. A: The impact of our plugin on the performance of your website depends on your usage of the plugin, and on the resources that are available on your server. Some of our customers have hundreds of feed sources importing thousands of items without a significant decrease in speed. Generally, the amount of resources consumed is directly proportional to the number of feed sources you have active, the number of feed items being imported, and the number of items already imported; all that multiplied by the frequency of imports. We also provide further recommendations here. Q: How will importing existing posts affect the SEO for the source site and original author? A: Content that is present on more than just the original source, i.e. “duplicate” content, can be an issue sometimes. A special way exists to notify search engines what the original source of the content is, and that is through something called a canonical link. 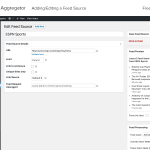 As for the author of the posts, the Feed to Post add-on also allows you to set the author of the imported posts to be any existing author, or even automatically create authors in your system based on relevant data in the feed – if provided. Not sure what add-ons or bundles you need? Let us help you.